Two Chabad-Lubavitch rabbinical students arrived in Reykjavik, Iceland, to help with Passover Seders for the local Jewish community. Berel Pewzner and Mendy Tzfasman boarded a plane to Iceland early this week, checking five bags full of Passover necessities, from the Haggadahs that retell the story of the Exodus to the handmade matzah and grape juice they’ll need for Seders Monday night and Tuesday night. “We would bring in brisket, but they have some regulations,” joked Pewzner. They’ll join families in Reykjavik, Iceland’s capital city, for the holiday celebration, and are spreading the word about the upcoming Seders using e-mail and social media. Sent to the North Atlantic island nation by Merkos L’Inyonei Chinuch, the educational arm of Chabad-Lubavitch, they’re partnering with the local community to coordinate food and venue logistics. The two rabbinical students – part of a cadre of 650 young men sent to all corners of the globe this season – will spend two weeks in town, running children’s programs, Torah classes and a Sabbath get-together in addition to the two Passover Seders. Sigal Harmeshi, a local resident who has helped organize the diverse community’s holiday events for years, said there are usually half a dozen families that come together for some combination of Rosh Hashanah, Chanukah, Sukkot and Passover. The Seders are like the ones she has at home in Israel, she said. It’s tough to get everything in order to celebrate together, she added, explaining that getting people to the Seder, especially given work and school constraints and it being in the middle of the week, can be difficult. So she invited Pewzner and Tzfasman to help connect the community. “I think maybe something different will push the people to meet again and to celebrate more holidays together,” she stated. Harmeshi hopes they’ll come back again, and possibly help provide the community with further Jewish resources, including kosher food for travelers and a place where locals can meet on a regular basis. Mike Levin, who has been living in Reykjavik since 1986, said it’s a difficult place to live as a Jewish person. “There’s no synagogue, there’s no rabbi,” he explained. Still, they’ve developed customs in the community, sharing Chanukah candle lightings, and planting trees once a year in a forest 15 minutes outside the city, though not on the minor spring holiday of Lag B’Omer because it’s too cold that time of year. 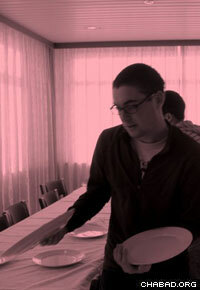 Jewish residents of Reykjavik set the Passover table. Levin pointed to the Seder as a time that everyone gets together and pitches in. Levin, who even tried to bake his own matzah one year because it’s not available in stores, said having guest rabbinical students this year seems like a good decision. “We’re sort of running out of steam, our community,” he said. Preparation this year was moving slowly, and nobody was taking the reins on getting everything set up, said Levin. Now they’ll get to meet Jews from other places, share their similarities and learn from their differences. He added that he is looking forward to meeting the guests; every time he meets a Jew from another place he learns something new, he said. Andrea Kasper, who has lived in Iceland two and a half years and currently lives with her husband and children in a tiny village of 530 people in the northwest part of the country, was contacted by the rabbis at the start of the process, several weeks ago. She said she’s not sure how they found her online, but as one of the community contact points, was happy to help gauge the community’s interest. “I got e-mails back from at least five families, who were like, ‘Yeah, this will be great,’ so that’s it, and they made it all happen,” said Kasper. Pewzner is looking forward to seeing the community gather together for the Seders. He hopes people come away with a renewed sense of Jewish pride and identity, and that their visit leads to future events for the group. it's amazing that Chabad has come to Iceland. It's one of the few places nowadays without a Chabad!